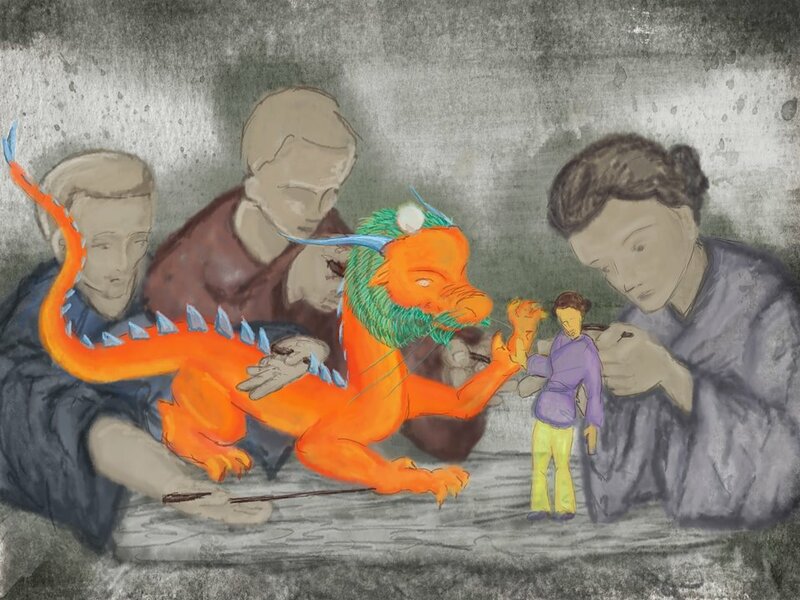 Concept rendering exploring how performers would relate to table-top puppets of Dragon and Min Li. 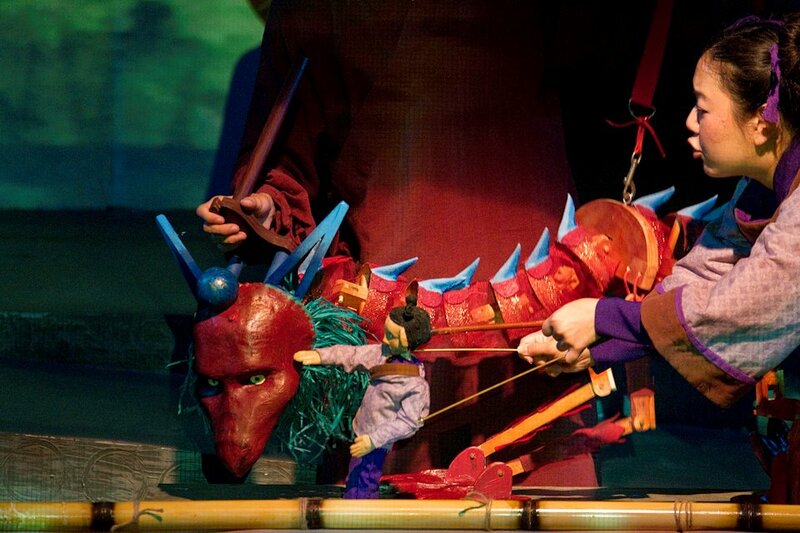 Table-top Dragon and Min Li rod puppets. 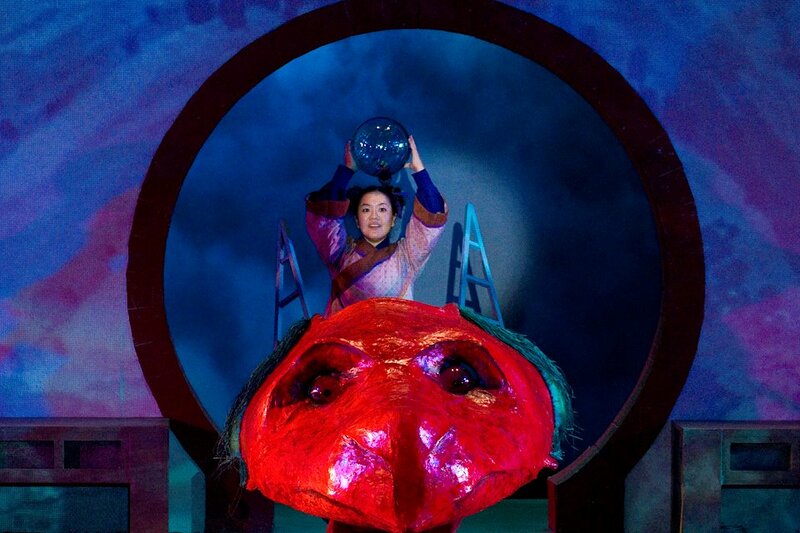 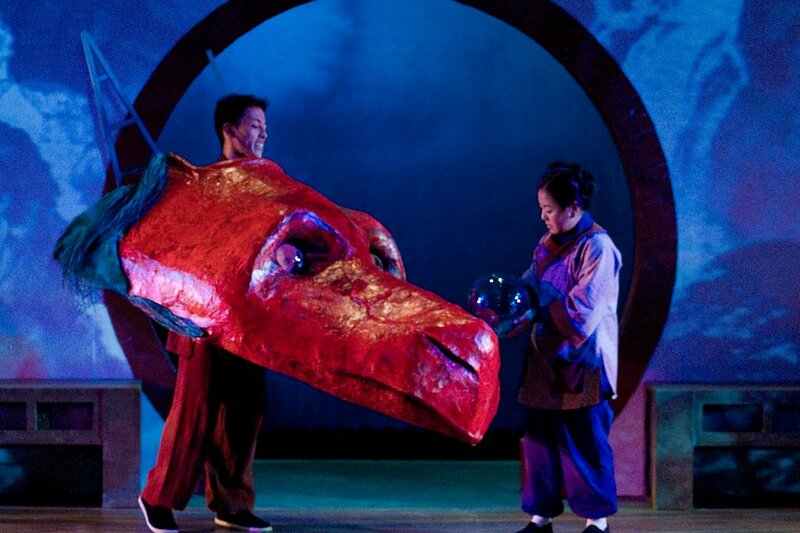 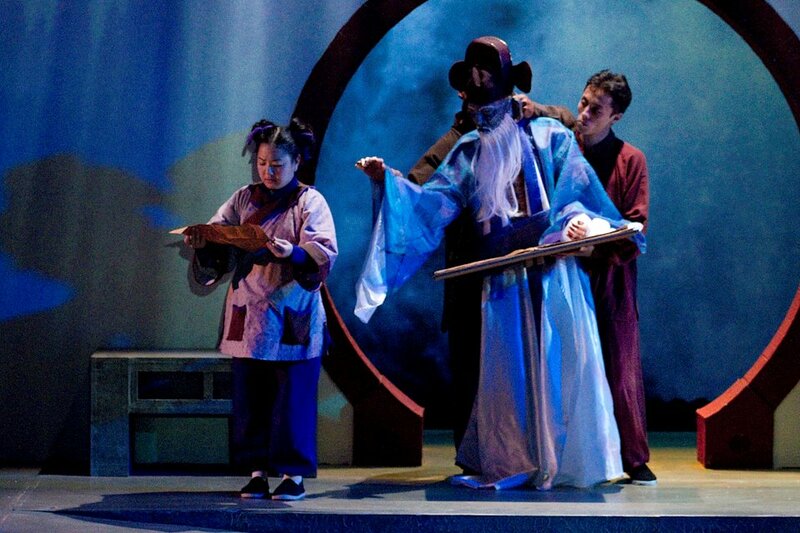 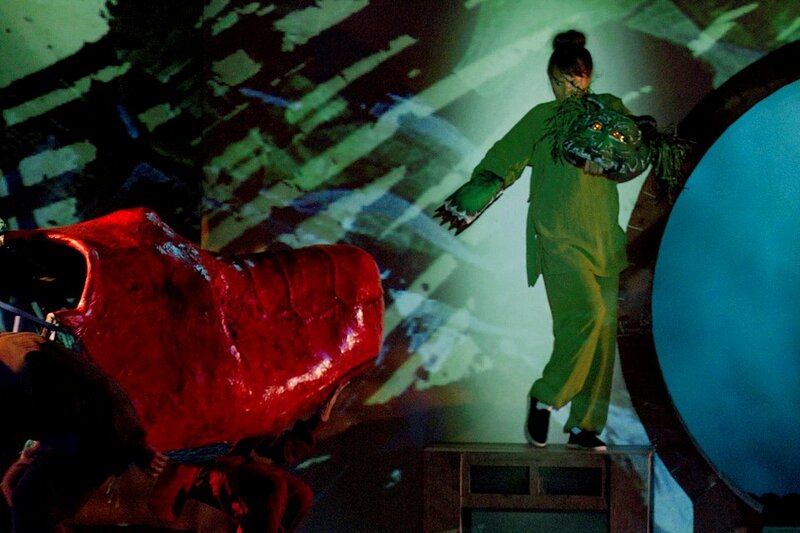 Min Li and Dragon were puppeteered on their own rolling puppet stage, a wall, or sometimes the floor of the stage itself. 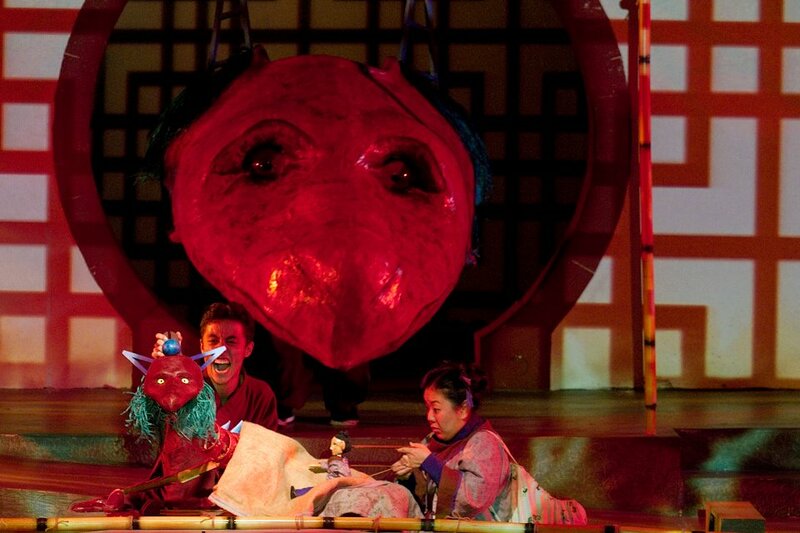 The puppets not only allowed the characters to relate to each other in scale, but allowed more dramatic interaction with their environment as well. 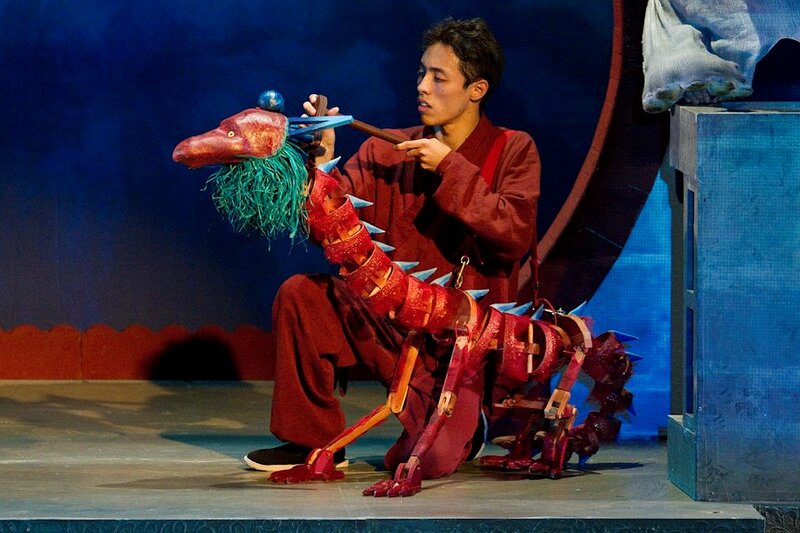 The small Dragon puppet had over 32 moving parts, most of them in his segmented ‘spine’, allowing for realistic movement. 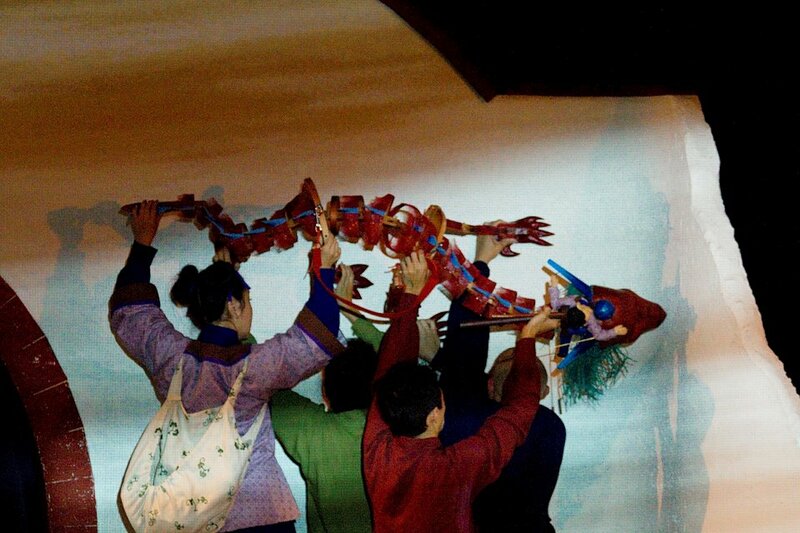 Many hands allowed for very dynamic actions. 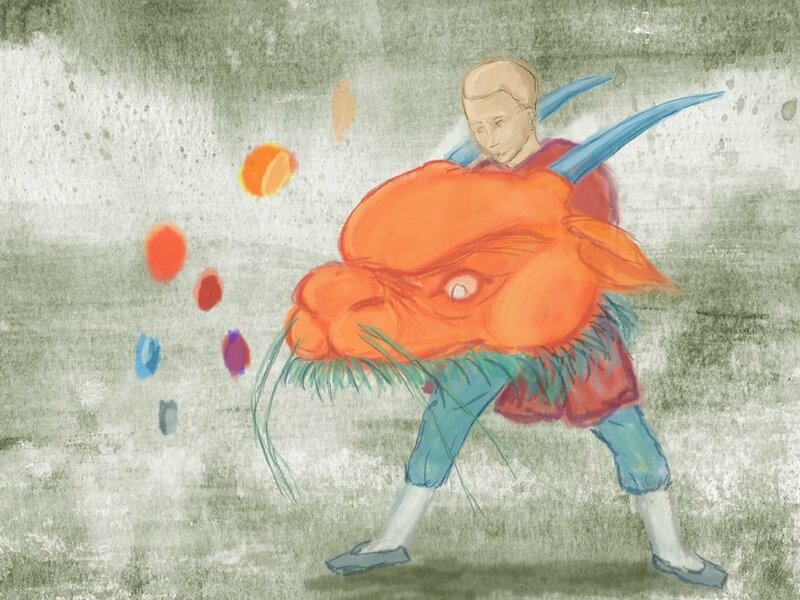 Rendering of a ‘full-scale’ Dragon head puppet worn on the puppeteers front. 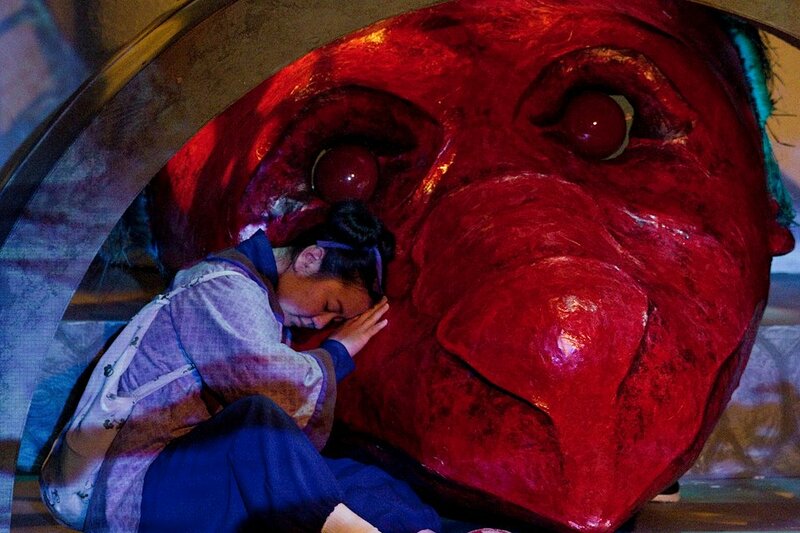 As well as relate to him physically. 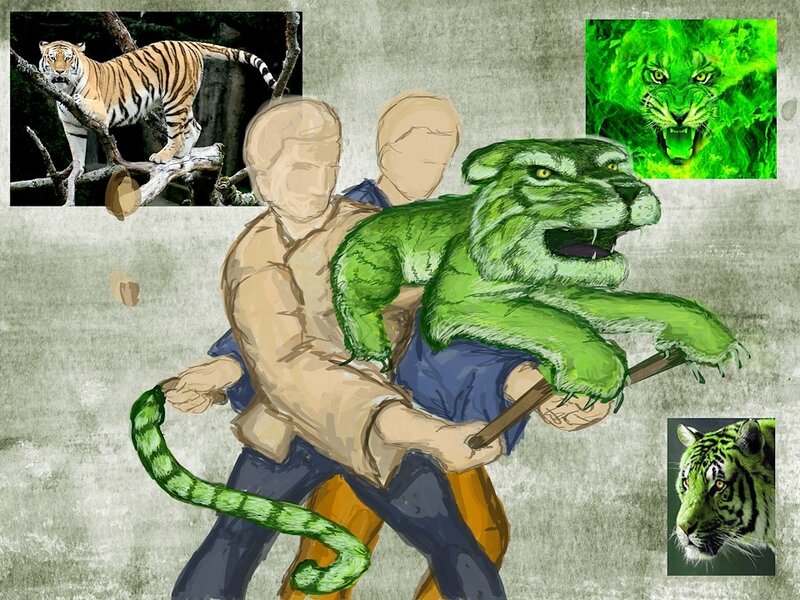 Rendering of a two-person green tiger glove puppet. 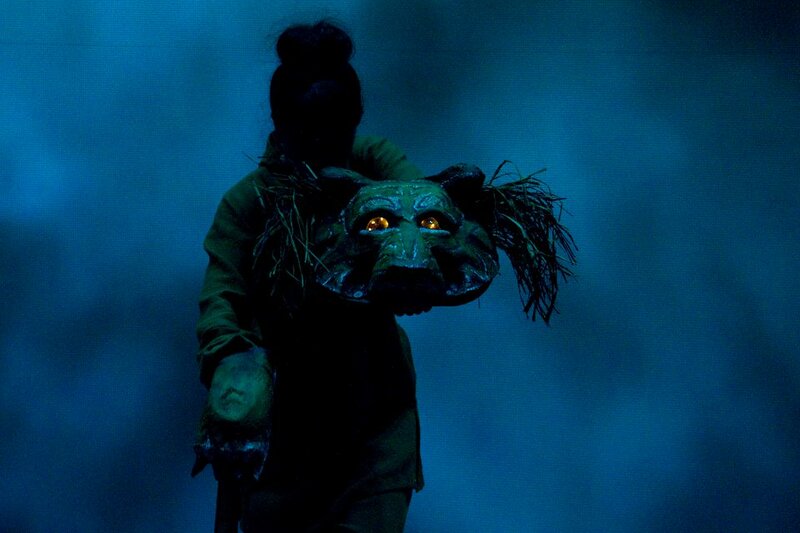 Final Tiger puppet head with light up eyes and paw/glove. 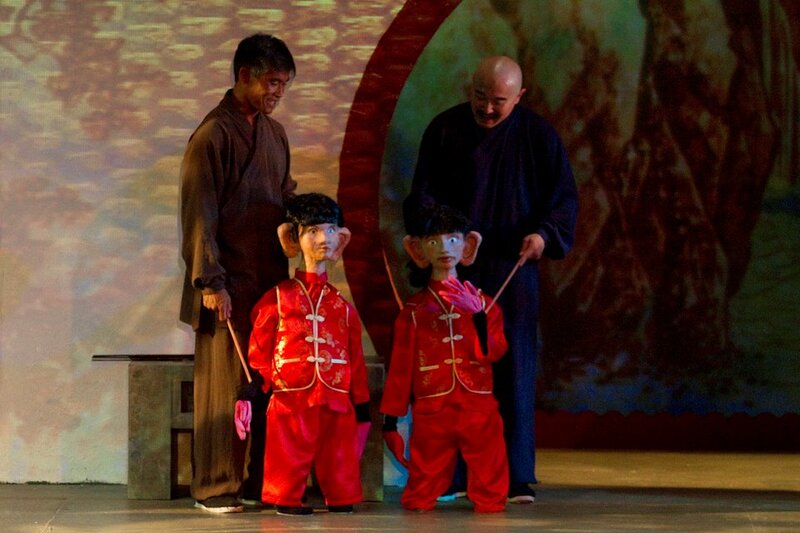 The two head puppets facing off. 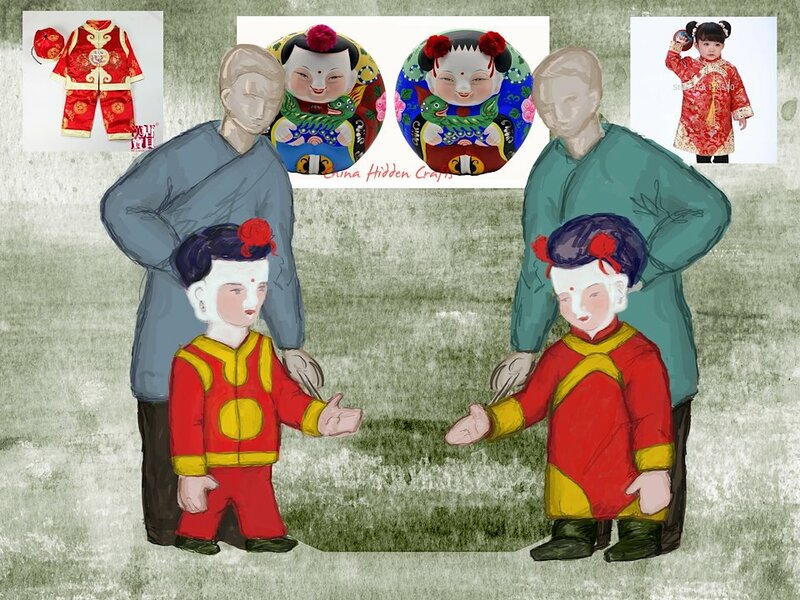 Rendering of half-scale twin puppets, referencing traditional Da Ah Fu figurines and how the puppets could be dressed in toddler clothing. 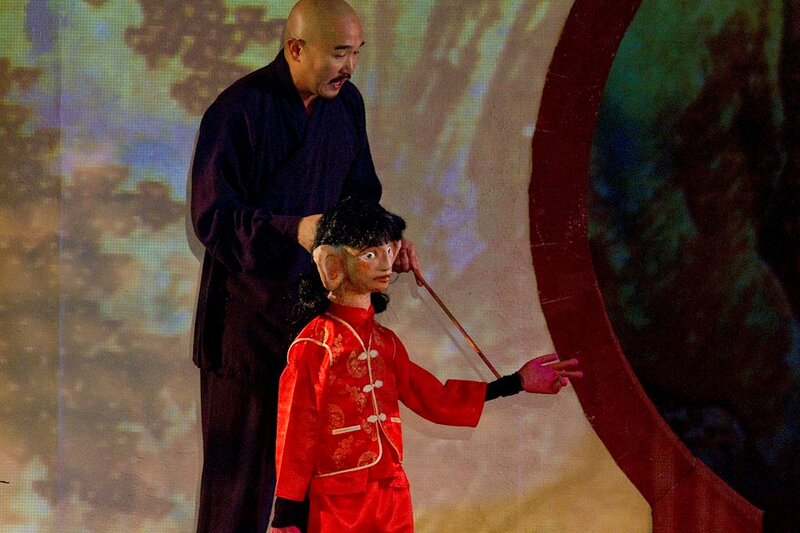 Ah Fu, half-human sized rod puppet. 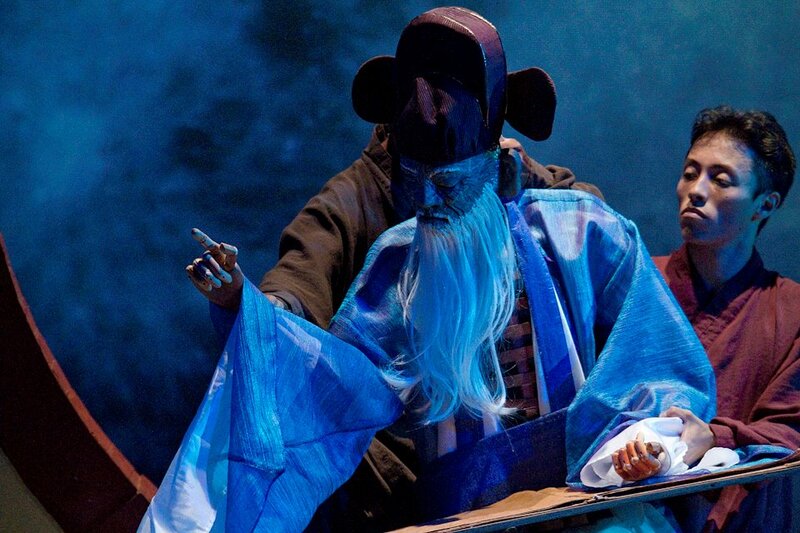 Puppet costume by Lacy Rohlf. 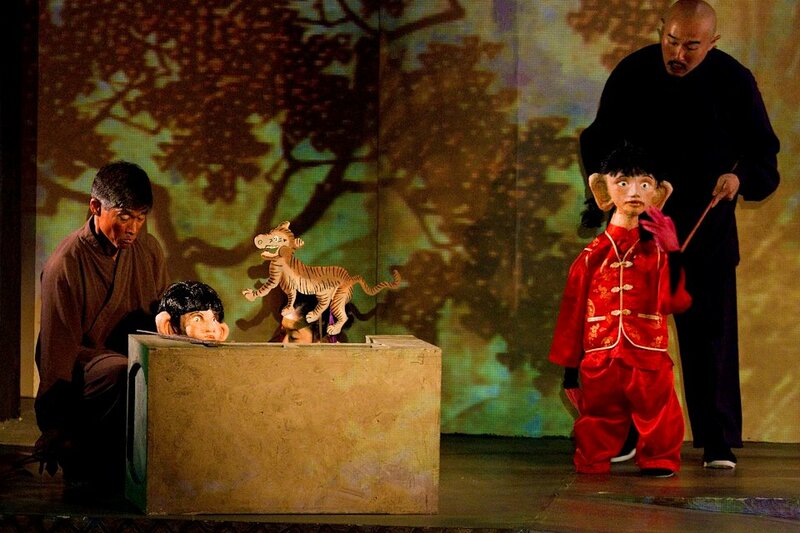 Puppets with puppets. 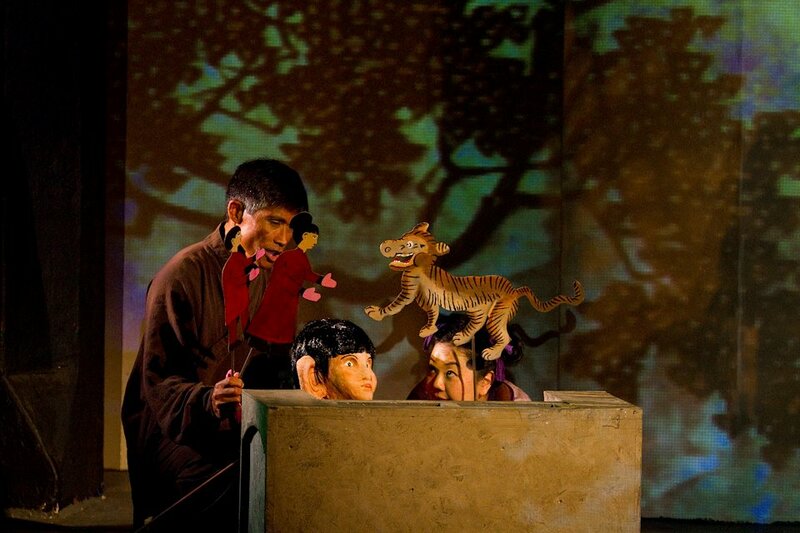 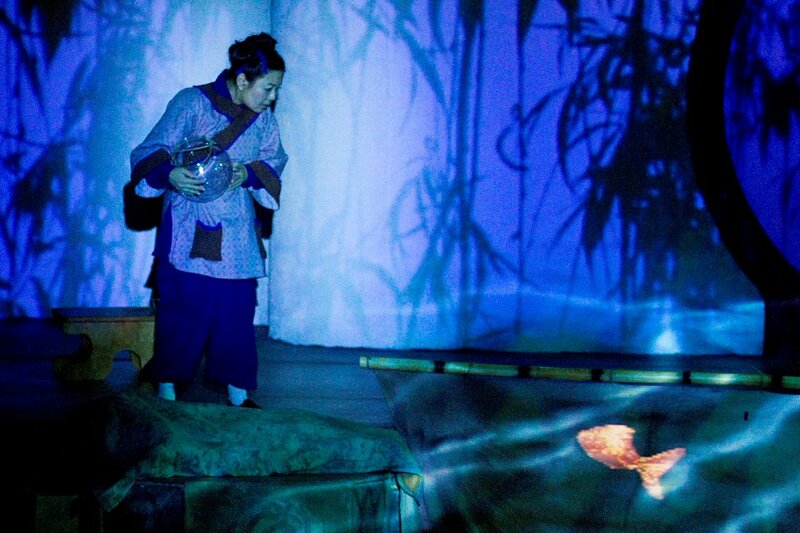 The “Shadow Tiger” puppet was based on a traditional Chinese shadow puppet of a tiger. 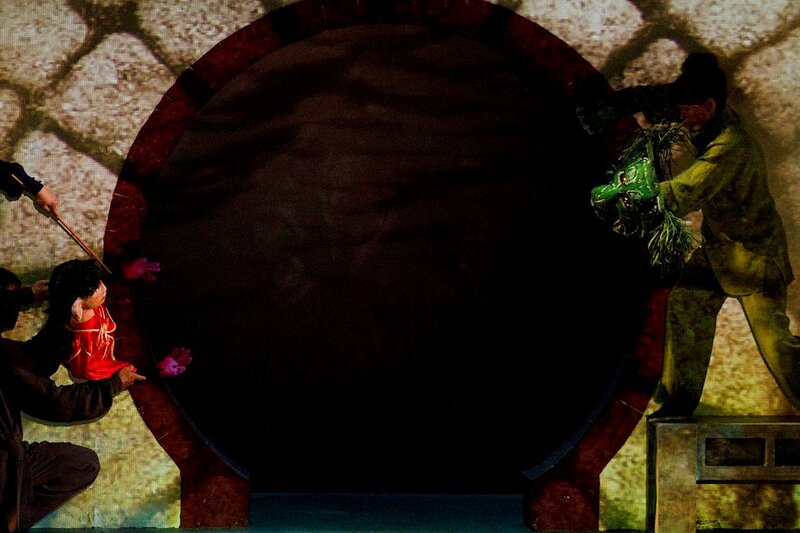 The puppets allowed the moon gate on the set to be turned into the mouth of the well that the twins trick the tiger into. 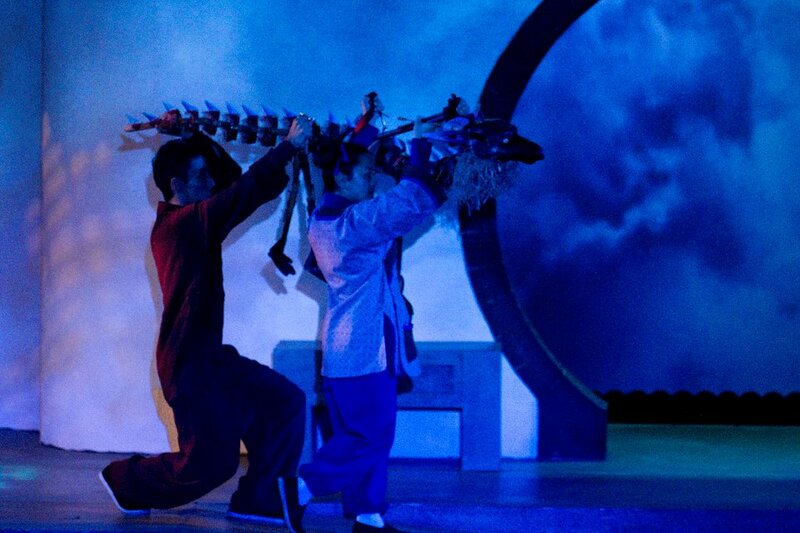 Da Fu and Ah Fu together. 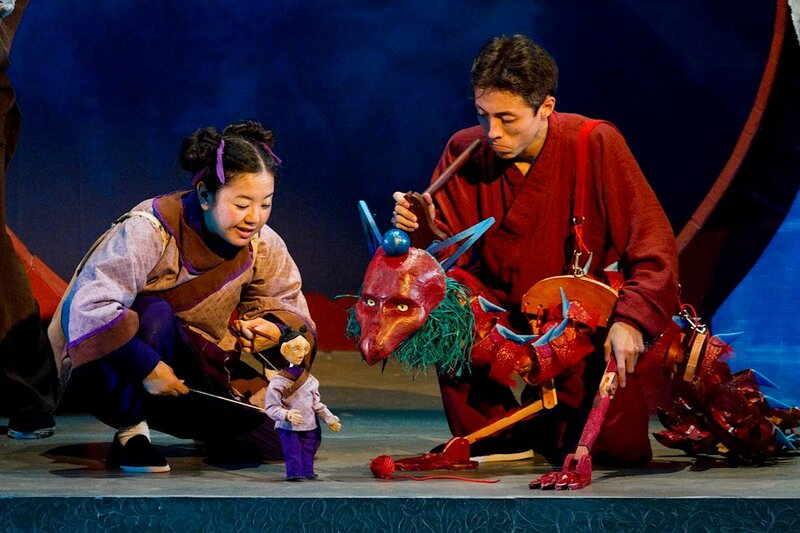 Puppet costumes by Lacy Rohlf. 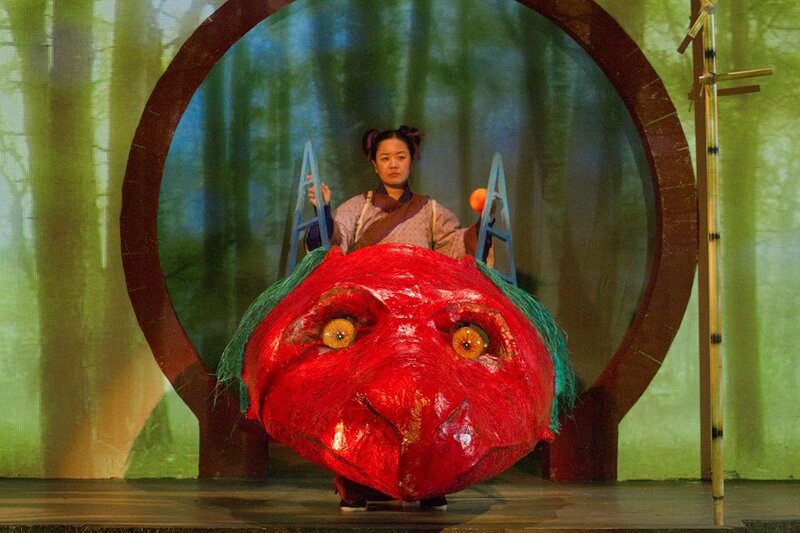 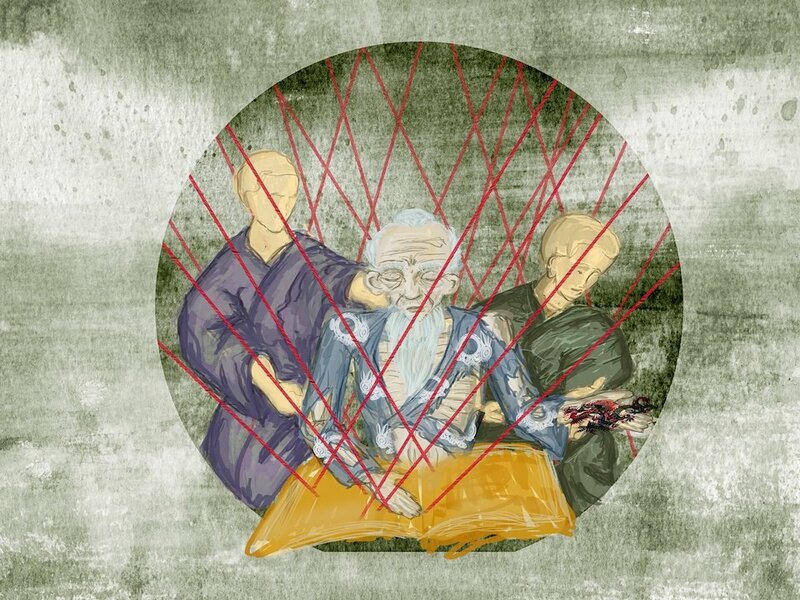 Rendering of human-sized Old Man of the Moon puppet. 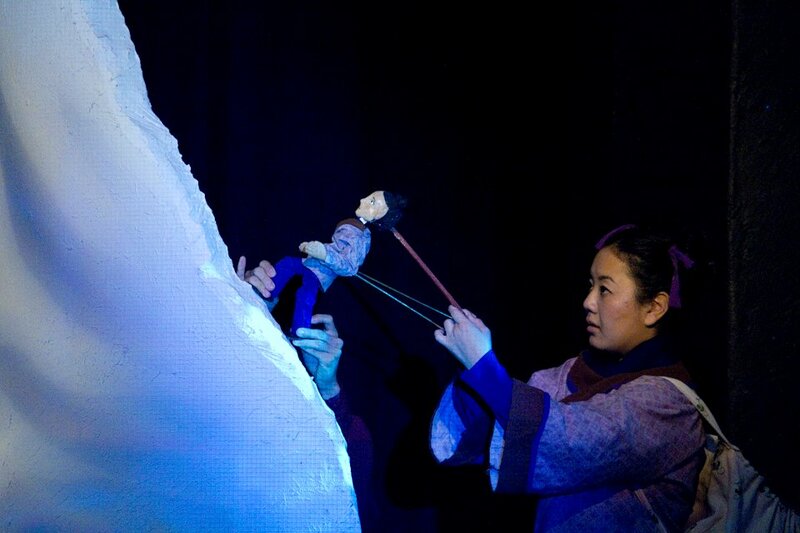 Human-sized doll puppet for Old Man of the Moon. 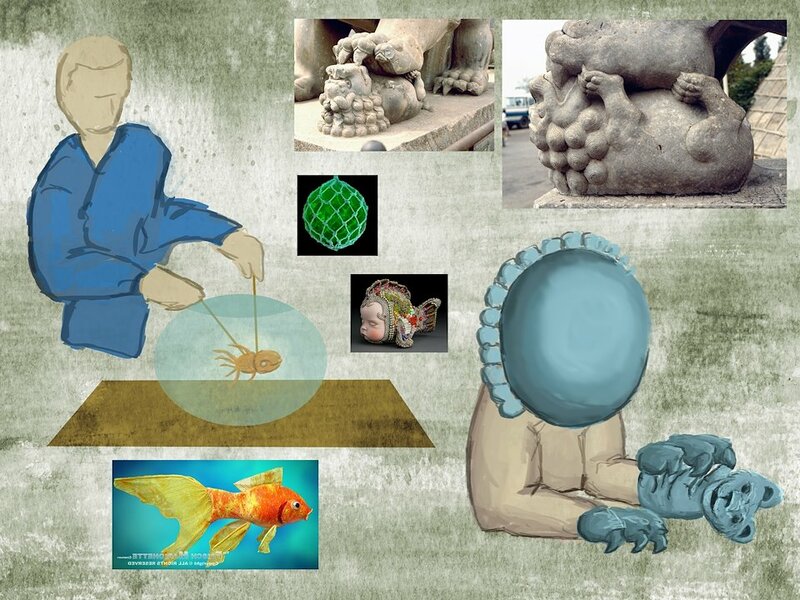 Rendering of goldfish rod-puppet (ultimately actually moved through stop-motion/projection) and baby lion statue glove puppet.